Of all the brilliant cars in 2012, there were absolutely some standouts; some came as surprises and some were no-brainers. The vehicles that made our favorites list were ones that left us lying in bed at night awake, fantasizing about just a few more hours behind the wheel. These vehicles were so good in fact that they brought us seriously close to pulling out our checkbooks and plunking down our own hard-earned money. In no specific order here are our five favorite cars of 2012. Producing 200 horsepower from a direct-injected 2.0-liter Boxer four-cylinder engine and mated to either a six-speed manual or a six-speed automatic, the FR-S is one of the finest rear-wheel drive economy sports cars of all-time. Starting at around $24,000, the performance to price ratio of the FR-S is unprecedented not only in the modern automotive market but in the historical automotive market as well. Developed by Subaru but paid for by Toyota, the FR-S also competes with a near-twin vehicle here in the states: the Subaru BRZ. 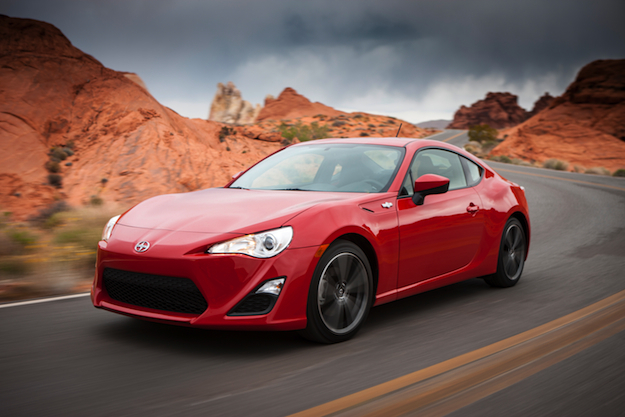 The FR-S is small, light, good looking, and affordable. With a well crafted but simple interior, the FR-S provides enough room for two adult passengers — even though it’s technically a four-seater — and some luggage in the trunk. While 200 horsepower doesn’t seem like much these days in a sports car, the FR-S is high-revving coupe that is eager to please. What it lacks in grunt it easily makes up for with its cornering capabilities. The FR-S comes from the factory with the same tires as the European Prius. This might make some scoff but it’s actually a brilliant choice. The tires provide enough grip to keep the FR-S planted to the road, but also the added benefit of being cheap to replace. As for why we chose the FR-S over its brother the BRZ, we felt the altered suspension setup of the BRZ added with its satellite navigation unit and increased sticker price made the FR-S the obvious winner. The FR-S is stiffer, lighter, and cheaper than the BRZ, and as a corner taming economy sports car, it gets our nod. 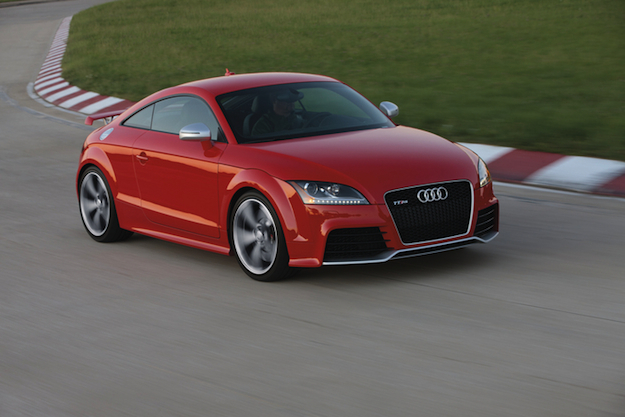 People went head over heels for the Audi TT when it first debuted. Not only did people love its design, but some TTs were flipping over at high speeds, killing passengers in the process. To solve this problem, Audi fitted a wing on the back, reducing the lift created by its distinctive body design. 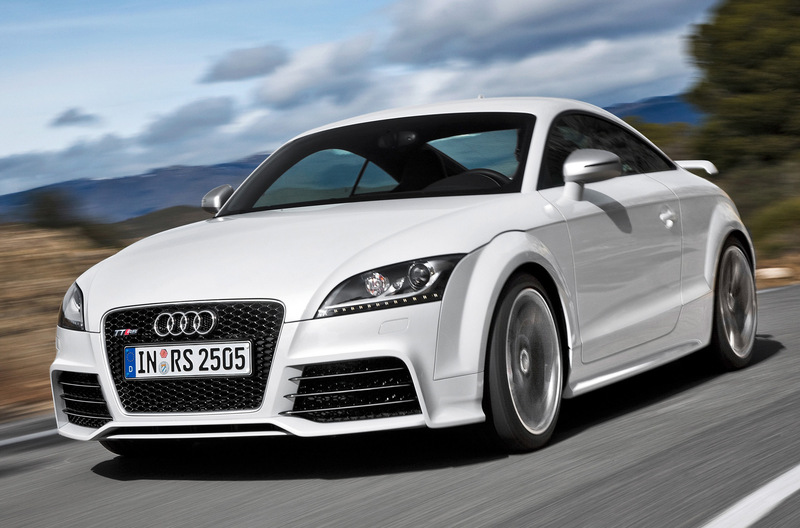 Since then, Audi has released a second generation TT along with a high-performance model, the TT RS. Unlike the first generation TT, which looked great, the RS is the one that makes us weak at the knees. We simply weren’t expecting the TT RS to be as good as it is, which is what made it even more exciting. Before we drove it, we thought Audi took a dentist’s wife’s car and put a bigger turbo on it. But oh boy, it’s so much more. Under the hood of the TT RS, Audi has given new life to its infamous five-cylinder engine and — just as we mentioned before — bolted a honking big turbocharger to it. The last time Audi had a five-cylinder with a big turbo was in the first generation S4. If you were fortunate enough to drive one, you’ll recall what sheer magic that engine was. This newest iteration is a 2.5-liter producing 340 horsepower and 343 pound-feet of torque. This cast iron block five will push the all-wheel drive TT RS to 60 MPH from a dead standstill in 4.1 seconds and onto a top speed of 174. Just to give you some idea of how simply magical the TT RS is, we drove it back-to-back with the 662 horsepower 2013 Ford Shelby Mustang GT500. The Shelby will do 0-60 0.1 seconds faster but everywhere else, the TT RS has it beat. Unlike turbocharged cars of the past, the TT RS pulls and pulls with seemingly no end to the powerband. The all-wheel drive and perfect suspension made quick work of sharp corners and the five-cylinder produced a soundtrack that makes us a bit tear-eyed to recall. At $56,850, the TT RS might seem a bit steep but for the power, luxury, and sheer driving enjoyment, it’s worth every penny. Consider this: we have a colleague who, once having driven the TT RS, traded in his Audi R8 for the TT RS. That’s how good it is. Let’s open with the figures: 580 horsepower; 0-60 in four seconds; top speed of 184 MPH; 11-second quarter-mile time; $56,550 price tag. Those numbers, thanks to its supercharged small-block V8, make the ZL1 the fastest Camaro ever. Competing directly with the $54,995 2013 Ford Shelby Mustang GT500, the ZL1 is a bit more expensive and not quite as powerful. But what the Shelby lacks, which is essentially everything at that price, the ZL1 includes as standard equipment, including; transmission cooler; differential cooler; dual-mode exhaust, and dual-mode suspension. Fire up the ZL1 and any motoring enthusiast’s senses will be alight. The loud, guttural rumble of the ZL1 is hypnotic and intoxicating. It’s on the open road, however, where we really fell in love with the ZL1. 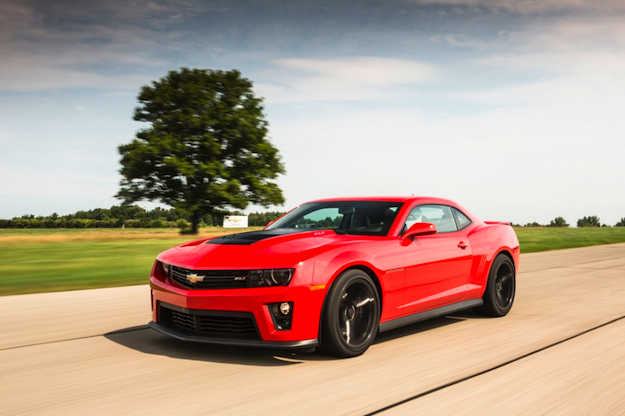 Unlike, well, every American Pony car before it, the ZL1 can actually handle. The huge 6.2-liter V8-powered ZL1 is surprisingly at home doing 120 through the corners and upwards of that in the straights. At those speeds, we burned through a half-tank of gas in 20 minutes, so we don’t recommend straying too far from a near-by gas station if you’re going to give the ZL1 the beans. We loved the ZL1 at 120 as much as we loved it parked on the side of the road. The interior is comfortable and the exterior is breathtaking. Although the Shelby GT500 is cheaper and has more horsepower, we’d choose the ZL1 over it any day. SLs of the past were rather bland in both looks and performance. In order to get an SL that really stood out and made your hair stand on end, you’d have to step up to an AMG model or, if you had a death wish, the SL Black. Thankfully with the debut of the 2013 SL550, customers can have a perfectly brilliant — and sane – hardtop convertible at a relatively reasonable price. Starting at $105,500, the SL550 is a rich man’s car. For that price, however, you get a lot. The SL features a metal folding roof that goes up or down in 20 seconds, making it a year-round convertible. Under the hood Mercedes has placed a twin turbocharged 4.6-liter V8 producing 429 horsepower, which has been mated to a seven-speed automatic transmission. 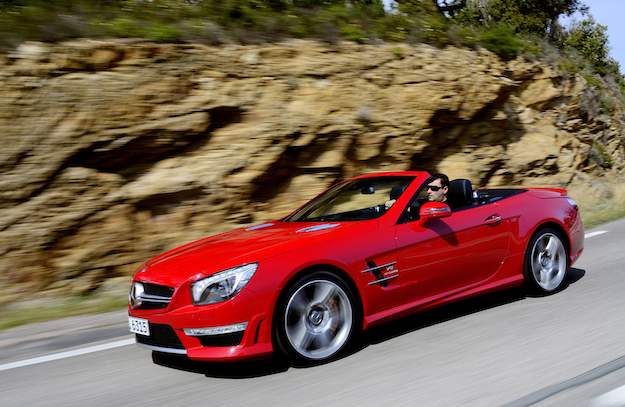 While the power in the SL550 is intense, it’s also very poised and predictable. Driving the SL, you’ll never feel afraid for your life or that this beautiful wedge of German steel wants you dead. On the contrary, with its massaging seats, active side bolsters that inflate in the corners to hold your body, and a heater vent mounted behind the driver’s head — called the headscarf – the SL cradles and massages you to 60 mph from a standstill in 4.5 seconds and onto a limited top speed of 155 mph. The typical SL550 buyer already feels like a million bucks, simply by looking at his bank statement. The SL550 has a similar effect but quietly adds that je ne se qua that only a hundred grand German luxury convertible can. We’ve only driven this one on the Leguna Seca racetrack so we can’t tell you what it’s like, say, driving your kids to school. We can, however, tell you what it’s like to drive at one of the world’s most infamous raceways: frightening; absolutely frightening, but in a good way. The F10 M5 is frightening because it is far more capable than you are. In it, you brake later and harder than your heart would ever allow in any other car. You can also accelerate more quickly and carry that speed into corners better than you would have ever dreamed. Powered by a twin-turbocharged 4.4-liter V8 producing 560 horsepower and 500 pound-feet of torque, and mated to either a six-speed manual or seven-speed M-double clutch transmission, the new M5 is simply untouchable in the performance sedan market. What makes the new turbocharged V8 so special is that the turbochargers are mounted in the V of the engine rather than shoehorned on the outside. This means the exhaust flows into the block rather than out to the sides like on a standard V8, and it’s these kinds of technical touches that make the M5 so remarkable. The list of things to highlight about the M5 is virtually limitless. The looks are subtle, menacing, and striking. The interior is simple, well laid out, and comfortable. The engine is insatiable. Both transmissions are — when compared to the competition — in a league of their own. And the $92,000 price tag is just as impressive. 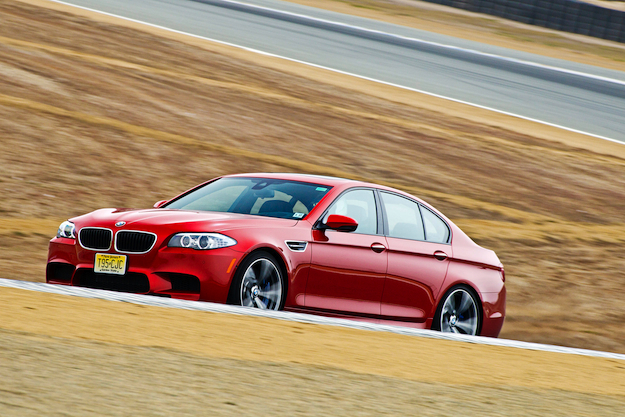 If we could see a reason for a track-taming four-door family car, the M5 would be our favorite car of the year. But when the standard 5 Series is so good, we just can’t justify the extra cost of the M5.